Neve 1073 EQ, Software parametric EQ from Universal Audio in the UAD Plug-In series. loudfunk's review"Great, great EQ plug-in"
Designed by the Rupert Neve company in 1970, perhaps no other studio tool is as ubiquitous or desirable as the Neve 1073 channel module. Without exaggeration, Neve consoles have been used on a majority of popular recordings of the late 20th century, and the 1073 easily tops the short-list of audio design masterpieces. The 1073 is famous for adding an unmistakable sheen and clarity of pres- ence to elements in the mix that is deemed unattainable with any other unit. Modeling the 3-band EQ and high-pass filter in painstaking detail and thor- oughness, Universal Audio's Neve 1073 EQ will deliver the same sonic ex- perience expected from its analog cousin with exacting detail. Bundled to- gether come two versions: The 1073 EQ with absolute sonic accuracy, and the 1073SE EQ for high instance counts. The install was the usual download, install, authorize, get to work procedure. No hitch as expected. Runs amazing on my PC desk top on 2 UAD-1 and a UAD2 duo card, and on my Mac Book Pro with a UAD 2 solo PCMCIA card. This is one of my favorite, if not my favorite EQ plug-in. Especially on guitars. Now the only difference between this and the hardware is that the software version of course doesn't emulate what happens when you crank a real 1073 and you get all the sonic gooeyness on your signal. But, with a little warming up of the signal before it will have you believe that you're listening to your guitar through an old Neve board. Beautiful! The only downside to it is that the controls are laid out as on the hardware version it models...obviously. And that is kinda reverse from where we all expect the bass and treble controls to be situated. If you need more instances of it there is a less processor hungry version included the Neve1073 SE. But I rather use the full version and freeze tracks if I need to. The Neve 1073 was a quick install without any issues related to installation or compatibility. After downloading it, I had it installed within a reasonable amount of time. The interface of the plug-in is easy to follow and is modeled after the old Pultec EQs. It has parameters to boost and attenuate a low frequency and a hi one. It also has a switch to choose what type of attenuation you would like. I don't have a manual for this, but it is easy to use and you shouldn't need the manual too much to figure out how to use this plug-in. I am running the Neve 1073 on a Mac Book Pro that has a 2.2 Ghz Intel Core 2 Duo processor and 4 GB of RAM. I run the plug-in in Pro Tools LE 7.4 that I have running with a Digi 002R audio interface. I have also run this plug-in on a Pro Tools HD system. With both of these configurations I never had a problem running a bunch of these EQs at once as they don't take up too much processing power. I've been using the Neve 1073 for about two years and have it to be one of the best EQ plug-ins out there in terms of sound quality and ease of use. It is easy to get a good sound from this and is great for notching specific frequencies. The price is reasonable but it isn't that cheap compared to some other EQ plug-ins. I like having plug-ins that are modeled after old gear, and this is a great model to make a plug-in after. Overall, the Neve 1073 s a great plug-in and I recommend it for both home and professional studio owners, as it is a great addition to any studio's arsenal. Plus its very affordable for the home based musician. Great buy. The Universal Audio Neve 1073 EQ plug-in was easy to install without any problems or compatibility issues at all. The interface is very easy to follow, as it is modeled after the old Neve EQs. There is a knob for line in gain, low pass, low mid, hi mid, and high pass. I don't have a manual for this plug-in, but it is easy enough to use that you shouldn't need one if you don't already have it. I am currently running the Universal Audio Neve 1073 EQ plug-in on a Mac Book Pro that has a 2.2 Ghz Intel Core 2 Duo processor and 4 GB of RAM. I run this plug-in in Pro Tools LE 7.4 that runs off of a Digi 002 R audio interface. With this configuration I've never had any issues running as many of these at a time as I'd like, which is sometimes one on almost every track. I have also run this plug-in on a Pro Tools HD system with the same results. Whether I am running the Universal Audio Neve 1073 EQ in Pro Tools LE or HD, it always runs smoothly and stably. I've been using the Universal Audio Neve 1073 EQ plug-in for about two years and it has become of my favorite EQ plug-ins to use. It is easy to follow and has a killer tone. I'm a huge fan of any old Neve EQs, and the 1073 is one of the best models. This plug-in is a great emulation of the 1073 and has a very accurate display to it. The price of the Universal Audio Neve 1073 EQ is pretty reasonable, and makes it a great EQ plug-in for both home and professional studio owners. 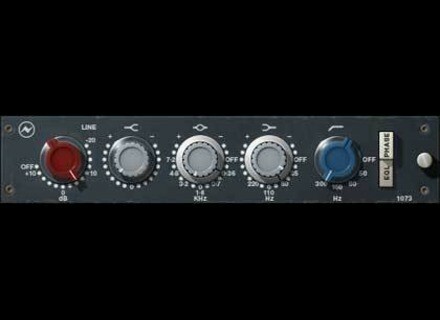 Overall, I highly recommend the Universal Audio Neve 1073 EQ plug-in for those looking to expand their EQ capabilities. otavioreis's review (This content has been automatically translated from French)" not bad at all"
I have a i7. Additionally a UAD2 Quad. So no performance issues to turn the plug on all my tracks. Not too greedy. It is really beautiful. Especially for the treble. I think this is by far the best modeling Neve EQ. Super EQ, gorgeous acute ("gives the air"), very nice color, warm and very effective!